Whether you have a new or older vehicle, regardless of the amount of miles it’s useful to use dependable oil and fuel injector cleaning systems. Sometimes, vehicle owners use fuel injector cleaners to temporarily renew, restore functionality, and hold over their vehicle fluids until the next oil change. Although nothing beats a fresh oil, filter, and fuel injector change or flush, some of the best fuel injector cleaners are quite useful in restoring power and performance to frequently used or aging cars. Carbon deposits and buildup in your fuel injection system can cause hesitation in acceleration, poor idling, and even engine knocking or decreased performance. Below we have outlined the best fuel injector cleaners for 2016, and will break down for you the benefits of each, and why customers choose these brands over the competition! This is considered by us the best fuel injector cleaner on the market! No matter how old or new your car may be, the Lucas 10013 Fuel Treatment is sure to bring peace of mind to your experience thanks to it’s proven ability to make noisy and unnecessary check engine lights go away and even reduce unwanted engine sounds. The Lucas 10013 Fuel Treatment is not only our top pick because it reduces emissions and improves fuel economy, but also because it’s been proven to add to the overall longevity of your vehicle – in particular, the powertrain. For those that use their car frequently, the Lucas 10013 is the most proficient, undoubtedly best fuel injector cleaning system of 2016 because it’s manufactured by a company that not only cares but also caters to professional racecars and advanced road vehicles. To sweeten the deal, the Lucas 10013 Fuel Treatment works both on Diesel and Non-Diesel vehicles. In fact, it even works on most marine equipment, at-home maintenance vehicles, and major lawn care equipment! The BG 44K Fuel System Cleaner is an excellent investment of your money and is rated as one of the top Fuel Injector Cleaners of 2016 thanks to it’s proven, chemical ability to reduce carbon deposit buildup, moisture, and to prevent future deposits in the future within your fuel tank. Those that leave their vehicles sitting for days and weeks at a time can expect the Ethanol, a major ingredient in car fuel, to rise to the top and create negative effects within both your fuel tank and in turn your fuel system. Sadly, this type of negative chemical conduction can be avoided in most cases through simple maintenance of your fuel injector cleaning system and gas tank. Both mechanics and official car dealerships alike trust the BG brand, and with over 21 years of experience manufacturing effective fuel system cleaning products it’s no wonder why feedback is so positive and its popularity so great. 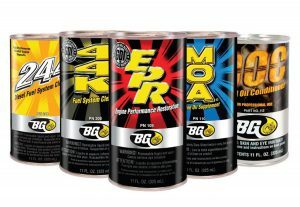 So whether you ride your vehicle infrequently, or ride it every day nearly all day the BG 44K Fuel System cleaner is an excellent solution to restoring and maintaining both fuel efficiency and engine performance, preventing damage to both the metallic and rubberized parts of your vehicle over time. If your major focus and car situation are that you’re looking to restore performance, fuel economy, and enhance engine functionality then the Red Line Complete SI-1 Fuel System Cleaner is an excellent direction to go. Red Line Complete SI-1 Fuel System Cleaner provides an excellent PEA (polyether amines) balance to remove carbon buildup from your fuel system, while effectively – yet not abrasively – cleaning and flushing out unwanted and harmful dirt’s, moisture, and other debris through your fuel system. Stumbling, idling, and hesitation in your vehicle can be caused by many mechanical malfunctions or even exterior elements. While for some situations it’s necessary and always good to check with a trusted, licensed mechanic people have effectively used and have been satisfied with the restoration quality and ability to dramatically improve their driving experience. 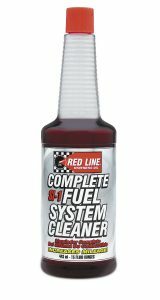 For those on a budget, the Red Line Complete, SI-1 Fuel System Cleaner is an optimal product, with a solid reputation, and plenty of satisfied and repeat customers. – An overall noticeably decreased ability to produce substantial or necessary acceleration when you put your foot into the gas pedal. – Hesitation going up hills, jerking, and even poor idling both when starting to accelerate, decreasing, or when first starting up and moving your car. Whether your vehicle is new (yet driven hard or previously) or old (and driven very delicately) dependent upon the environment, weather, and what you put your car through over time it’s sure to lose functionality and over time inherit particle-caused problems. These include dust, dirt, carbon and other harmful buildup throughout the fuel system, calipers, intake valve, fuel injectors, and intake manifold. Even more concerning, the combustion area in particular which your fuel system is connected to directly which relies on other fluids and oil from your vehicle. 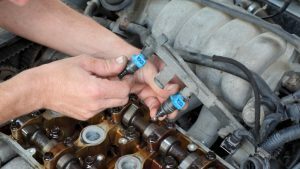 What this means is that if you are not properly maintaining, have neglected, or are pushing your vehicle harder than you keep up on its maintenance, fuel injector and system problems can easily develop into much more serious and expensive problems. You might be asking yourself in consideration of the top fuel injector cleaners presented here combined with your knowledge; what actually makes the best fuel injector cleaner? 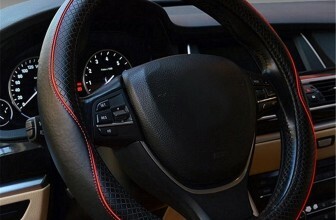 What are the ingredients or results to look for, and how can you go about doing this in the most effective way to protect not only your car but also your wallet? Outside of the more commonly known or obviously stated benefits and effects of a good fuel injector cleaner here, such as improved fuel efficiency, the reduction of unwanted engine knocking or noises, and the removal of unnecessary and inaccurate readings, how and what your fuel injector cleaner product is made of is actually more important than most people think! When you’re trying to figure out what the best fuel injector cleaner is for you and your car, step outside of the more common ‘know-how’ and consider also the strengths of the product per both it’s online and offline reputation. Do mechanics and car dealerships trust and use it? Why or why not? Also keep in mind, some might agree that fuel injector cleaners made and available on the market that are cross-application friendly such as being used on marine vehicles, at home maintenance equipment, or both diesel and non-diesel vehicles have an especially strong appeal or value. Any customer that felt this way is by no means wrong for doing so, and it’s more common than you probably think. If and how your fuel injector cleaner can be used says a lot about not only the product but also the company that manufactured it. What are octane ratings, points, and what do terms like EPA, PEA, and PBA mean to me? It’s really important to keep in mind as you consider each possible fuel injector cleaner on the market that just because it meets EPA requirements or minimums does not necessarily obligate the product to prevent deposits from forming in your fuel system. 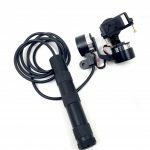 Therefore, again, reputation is critically important in many cases, especially with newer or otherwise unknown brands and products for ‘fuel injector cleaning’. Fuel Injector Cleaners that are built with the polybutene amine known as “PBA” have been scientifically found to be more effective at removing carbon buildup, deposits, and other harmful dirt or moisture from your vehicle’s intake valves, ports, carburetors, and of course the fuel injectors themselves. These products, in particular, are the most well-known and popular for effectively lowering the emissions from your engine, in turn aiding in the passing of emissions and inspections annually or every two years as required by law. In turn, renewing engine performance and acceleration not otherwise experienced anymore are also great benefits to PBA made fuel injector cleaners. Unfortunately, PBA’s have in many recent cases been found to actually contribute to deposits and carbon buildup in the combustion chamber, given the right environment, weather, and vehicle (including fuel) type. This is why more modern additives like polyether amine (PEA) are desirable, as they are cleaner, and made with more trusted chemicals and were designed by one of the world’s most trusted brands, Chevron – the product itself commonly known as Techron. Extra Knowledge: Octane ratings and point improvements are absolutely important when deciding on a fuel injector cleaner. The more points reduced not only allows for a more affordable fuel grade, but also increased fuel efficiency or how it’s ‘burned off’ over time – not to mention it’s environmental benefits too. The Lucas 10013 Fuel Treatment is not only an excellent product for cleaning your fuel injectors and system, but is also designed to effectively restore engine functionality. 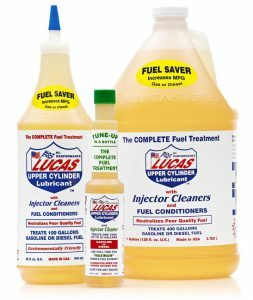 If restoring performance and an optimal condition of your fuel system, engine, acceleration, and other powertrain parts is your goal, then the Lucas 10013 Fuel Treatment cleaning system is the way to go. Best of all? 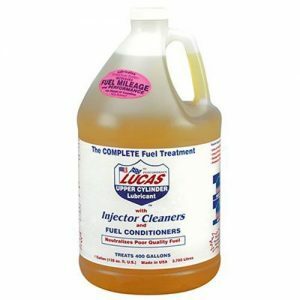 This Lucas Fuel System Cleaner, in particular, comes in a 1-gallon container, and at about 1/2 cup per 10 gallons of gas, this entire bottle could easily last you up until nearly a year. A great feature about this product and other Lucas auto system cleaners is that it’s really saving you money in the long run, in fuel efficiency and unwanted or premature repairs. If you experience rough idling, drive a truck, other heavy vehicle or put frequent wear on your car then this fuel system cleaner is really a great solution to smooth out your driving experience and get rid of unwanted idling hesitation. Lucas products in general appear to be designed to suit nearly any of our vehicle needs, which include common house maintenance vehicles like lawn mowers and some other power, construction maintenance tools. If you’ve let your vehicle sit for a while, then the Lucas 10013 Fuel Treatment is an excellent way to go as it provides the necessary lubricant and conditioning chemicals that will wear away abrasions, moisture, and carbon buildup within your fuel injectors, pistons, and throughout your fuel system before it’s too late and your powertrain pays the price. If you have a higher mileage vehicle, using this fuel injector cleaner can be very effective as it has a flush-like chemical agent that is designed to remove and expel unwanted harmful dirt and dust that’s built up in your fuel tank over time. This is a great example of why it’s desirable to use fuel system and injector cleaners such as this on an empty tank or before filling up at the pump. This product is also designed for diesel vehicles, and because some states and gas pumps have harmful or poor quality diesel it’s natural that you will accumulate unwanted, harmful chemical buildup that only a specialty fuel injector cleaner like this could take care of. Very few customers with substantially high mileage on their vehicles have stated that after an application of this Lucas fuel treatment that the problems they were experiencing with their drivetrain, noises, sounds, or even smoking coming from their vehicle increased. 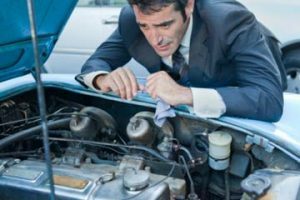 This is a valid concern, but is also a perfect example of how fuel injector cleaners are not designed as a ‘fix all’, or meant to replace a legitimate mechanic visit to address or discover any other underlying mechanical issues. Some customers have reported that with a bottle or less, they are experiencing little to no results. This could mean at least one of two things. Either one, the harmful buildup of carbons or other debris in your fuel system will require additional applications. If not, it could mean that a total fuel filter and oil change is necessary, and inspection (see above) of other moving parts and mechanical failure possibilities must be considered and explored by a professional mechanic. Lastly, some customers have reported ‘worse condition’ spark plugs or other moving parts after a year or more of using this Lukas Fuel System cleaner. In one instance a customer reported a more than 1MPG drop upon using this product. These two examples, much like the prior again illustrate why it’s important to address electric, mechanical, and other physical issues or concerns with your vehicle in a trusted mechanic shop, not relying on a fuel system (based) cleaner to solve any and all negligence or maintenance issues with your vehicle. If you’re frequently using your vehicle, have high miles, or let your car sit often the BG44K is undoubtedly the best fuel injector cleaner for the money considering how effective it is at reducing negative ethanol effects on your engine system and restoring functionality. With gas pumps varying by state and trending pumps having 10% or more of ethanol in their fuel, given the process of moisture collection, rust, corrosion, moisture deposits, and carbon all will contribute in no time to the demise of your car. In fact, even for those that merely often let their car sit in the garage, the threat remains real. Without the use of your fuel system regularly with a substantially full tank you run the risk of rough idling, poor acceleration, unwanted noises, sensors, shimmy and even shaking from your engine. Customers have been extremely satisfied with the BG44K fuel injector cleaner and that includes those with big pickup and work trucks. Dealers and mechanics alike trust and frequently use the BG44K product regularly, often alongside regular maintenance as it maximizes the removal of carbon built up and baked on debris dirt and dust from critical fuel system areas like the intake valves and carburetor. The BG44K has been regularly used and recommended by major West German dealers and mechanics as well, including Mercedes-Benz and BMW. For those experiencing rough cold starts, random and inaccurate misfiring codes, and poor idling when stopped at the traffic light the BG44K is an awesome perspective solution, affordable, and an overall trusted product. 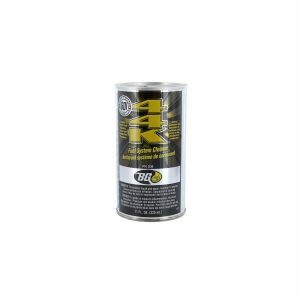 Mechanics and repeat customers have reported the BG 44K fuel system cleaner to be akin to a complete fuel system cleaning and maintenance. While one should not be substituted with the other per say, it is not unheard of to compare and appreciate that this fuel system cleaner by BK does indeed clean, remove unwanted and harmful buildup, restore, and prevent harmful chemicals and buildup in the future throughout your fuel system. Customers report experiencing dramatic differences and improvements in functionality all the way to the sound of their engine in as little as half a tank, while others state at approximately 200 miles being their substantial changes and fuel efficiency mark. All in all, for those experiencing problems like cylinder misfiring or looking for a preventative maintenance product, the BG 44K Fuel System Cleaner is an excellent place to start. 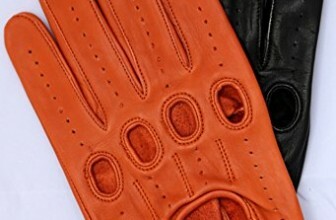 Some customers have reported or experienced no changes in performance and a dissatisfaction for the price paid. However, for vehicle owners that are not experiencing any troubles with their vehicle such as those mentioned above or in general, it’s unlikely beyond a preventative nature to experience any changes while driving otherwise. Unnecessary or repeat maintenance within unusually fast time can not only be expensive, but it can actually harm your vehicle if done to excess or unreasonably – especially in sensitive weather climates. Few customers have reported that troubles with hesitation (acceleration) have not been, if at all, improved after applying the BG44K fuel system cleaner. In some cases, poor acceleration or throttle response can mean something more much serious, such as a slipping or otherwise failing transmission. In fact, neglected vehicles, fuel systems, and engines over time can be responsible for being directly attributed to such major powertrain failure if neglected beyond excess. Other customers have reported only noticing improvements in fuel efficiency days after application, while others reported that they only experienced positive improvements in certain fuel system and powertrain areas while not in others. Just like any fuel system cleaning product or fuel injector cleaner, a customer and vehicle owner should not expect this product to solve any or all specific problems they are having with their car. At the end of the day, you likely know your car better than most people, and dependent upon maintenance consistency, weather and exterior conditions, neglect, abuse, or unknown accidents and incidents different moving parts could be damaged, rusted, worn, or need to be replaced. When in doubt, always seek out a trusted, licensed mechanic. The Red Line Complete SI-1 Fuel System Cleaner is a premium, excellent fuel injector cleaner on a budget for anyone looking to restore the condition of their vehicle that’s been sitting a long time. Thanks’ to its active polyether amines (PEA) ingredients, ethanol carbon buildup, moisture, and combustion leading to water and later rust can more actively be treated and prevented with this Red Line fuel injector cleaner. Customers have reported that the throttle response in their vehicles and even idling dramatically improved within the first or second application of the Red Line Fuel System Cleaner. The active PEA ingredients and conditioners in this fuel system cleaner help to flush out unwanted gunk build up, and prevent both erosion and problems in the future by removing moisture from your fuel system and tank. The Red Line SI-1 not only serving as a fuel injector cleaner, but as a total fuel system cleaner has been demonstrated to improve your general ‘octane rating’, in turn minimizing costs at the fuel pump and in the long run improving both the life and processing of your fuel and the necessary combustion along with your engine to power your car. Customers have even reported observing gunk and carbon build up on their spark plugs and pistons, but after using this Red Line product experiencing like-new parts and in turn a dramatically improved firing performance. For those that live in cold weather or environments, this is especially valuable, as both cold starts and general fuel delivery to accelerate your car in harsher environments requires a clean fuel system and all functioning parts to be working at their best. To top it all off, on a budget you’re still getting the most for your money with the Red Line SI-1 Fuel Injector Cleaner as it efficiently cleans and restores your intake valves from deposits, and thanks to its conditioning chemical ingredients reduces and prevents future run-on and pre-ignition troubles. Both your control system and emissions benefit from using the Red Line SI-1 Fuel System Cleaner and with cleaner fuel injector heads you can expect more stabilized gasoline, and fuel economy. 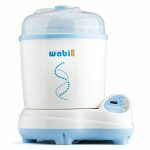 Several customers have reported back that they are unsure if the product works. As with any fuel system or fuel injector cleaning product if your fuel system and parts are already in good condition before starting, along with your fluids, then it’s unlikely to notice any dramatic differences, at least right away. However, with continued use, start-ups, and time it’s likely the application of a fuel system cleaner like the Red Line SI-1 will pay for itself. Because there appears to be a trend not only on this product, but most fuel system and fuel injector cleaning products, in general, receiving feedback or reports that they ‘don’t make a difference’, it’s worth recommending to observe the condition of, and any changes without the product first. It is understandably difficult to demonstrate a successful product or effects if you are uncertain of any noticeable problems or experiences in the first place. This includes MPG fuel efficiency improvements and acceleration. However, cold start-ups, idling, acceleration (especially over inclines), and any noises emitting from your engine understandably would be much easier to track and use to determine whether or not this product is best for you, your vehicle, and the circumstances or concerns. Are these Fuel System Cleaners Right for Me? Determining whether and which, if any, of these fuel injector cleaners, are best for you and your vehicle really boils down to the specifics of your expectations, vehicle type, condition, and regular maintenance before using the product. If not anything, ensure you focus on the above fuel injector cleaners we’ve rated as the best this year for being high-performance fuel injector cleaners, and ones that can and should be used regularly. It’s likely unrealistic and unfair for you to expect immediate improvements or changes on the first application of any of our approved and reviewed fuel injector cleaners, but this doesn’t mean to give up! In fact, the ones presented above and most fuel system cleaners in general, recommend several applications, over a certain time period or consistency. Also, many of the fuel injector cleaners above are also best used when alongside regular vehicle maintenance, such as engine fuel and filter changes and fuel system maintenance. Lastly, don’t forget to empty or allow your gas tank to go relatively low before applying any of these fuel injector cleaners to maximize results, and allow the ingredients to really do what they were designed to do. 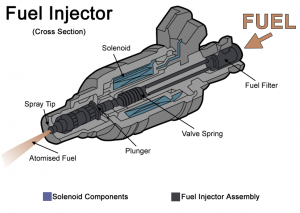 It’s important that you take the time to diligently research, consider the pros and cons of each product, and completely understand what types of fuel injector cleaners are available on the market now, what they cost, are designed to do, and of course their design and application to your vehicle and fuel system in particular. For example, you obviously do not want to buy a non-diesel friendly fuel injector cleaner for a diesel vehicle, just as you would not be doing your car a service by feeding it diesel-only fuel system cleaner if it’s an ethanol-gas based car-only. 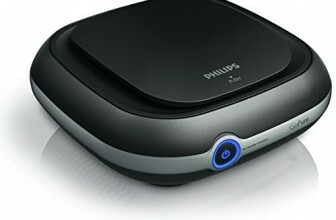 So whether you’re an everyday commuter, a hobbyist, someone who frequently uses marine watercraft, and even for those that are often (even professionally) doing lawn work that uses equipment which draws on compatible fuel, a fuel injector cleaner is really an all-around excellent product. They are designed to improve performance and protect the vehicles or equipment you have invested your money in. Lastly, fuel injector cleaners are great for car owners looking maximize fuel efficiency, pass smog and emission inspections, or of course just maximizing longevity in general.